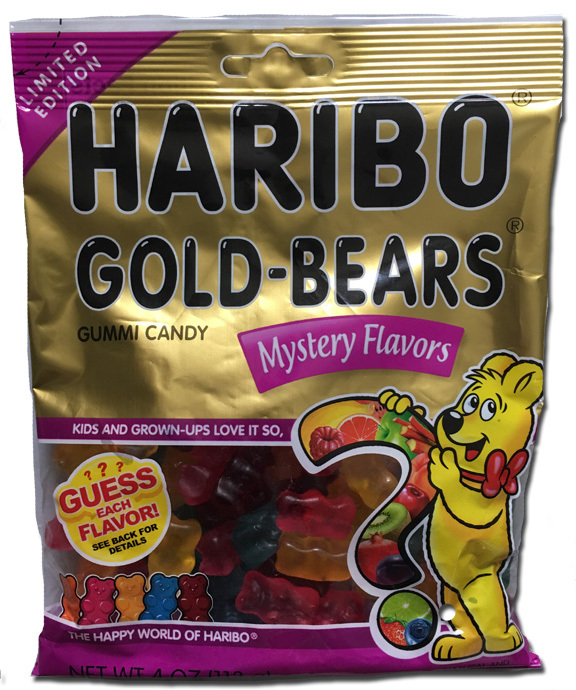 The things that make Haribo Gold Bears the gold standard for gummy bears are still inherent in these new, unknown flavored bears. So that’s good. They didn’t lose the chew, the deepness of the flavors, the aroma that only Haribo has. 2. If I could tell what the flavors were. I took the 5 flavors, hid them behind my computer and put one on my mouth at time, without seeing the colors. First one in: muted flavor, fruity, bit not berry. Kinda menthol-y too. Weird. Second one in: Also muted to start, totally hard to figure out. Semi citrus.. MAYbe tangerine. Big maybe. Third one in: more floral at first, definitely a blue raspberry type of flavor. Fourth one in: this is a cherry something. Maybe black cherry. Fifth one in: way clearer than any before. This is is citrus, but not lemon. Not orange. THIS must be tangerine. Blue: Yep, blue razzberry. Does have a VERY slight menthol thing happening, which I like. Pink red: Gotta be strawberry. Light yellow: not sure. grapefruit I think. Dark yellow: yeah that’s tangerine. Still, I like these bad boys. They ARE Haribo after all. Awesome, similar to the oreo cookies. I am currently working on attempting to filter out the artificial flavors in “mystery oreos” at my college, and I might pick up a bag of these too. I got these and checked the Haribo site, but it has changed with an ad for a new product. Can you post the flavors that you saw on the website? I think one is watermelon.